As I munch autumn pears in the cool breeze of a near-October evening, it seems slightly incongruous to recall the glorious summer’s day — the kind that makes you forget the rest of the abominably cold and wet summer’s days — that I visited Glen Moray. The previous day’s dramming at Aberlour and Balvenie had prepared me for the all-too-rare combination of whisky and sunshine, but this day’s pace was less frenetic, its agenda much more open, plus I’d had a full night’s sleep and a proper breakfast. The relaxed style of tour at Glen Moray, then, felt fitting. The whole tour was fascinating but laid back, lacking canned marketing speak and instead more like a dialogue with the guides offering local knowledge and fun facts. For instance, one guide pointed out a road winding through the distillery grounds which was the original way into Elgin and over which Macbeth, among others, is said to have travelled. The road also happened to pass a wee cottage where the excise man used to live — yes, on site! I’m sure today’s excise men are quite disappointed this is no longer the case. By far the best part of this tour, and most tours, was the warehouse. Here I learned that distilleries throughout Scotland (and presumably elsewhere?) swap casks every so often, storing each others’ aging spirit in their respective warehouses. This is done as a precaution in case some unforeseen disaster — a fire, for instance — were to wipe out the stocks of the distillery on-site: at least there would still be something left in the other locations. Glen Moray have also put transparent lids on some of their casks, allowing one to observe the color of the spirit as it ages as well as its dissipation, the fabled “angels’ share” which evaporates through the porous wood year by year. The distillery folks have done another clever thing: setting out different kinds of casks on their sides and allowing visitors to remove the bung and smell the spirit within. (I think I’m sniffing a port finish here.) Although I am pretty familiar with the different aroma profiles of various casks and finishes, it was enormous fun to go from cask to cask and inhale each in turn, especially with the pervasive curtain of general whisky-scent hanging all around me. Oh yes, it’s dram o’clock. After the tour, of course, we proceeded to the tasting. I hadn’t previously tasted Glen Moray, so every dram interested me. The guide gamely offered the 8, 12, and 16 year olds, and then allowed us to sample other, less common expressions. While the 16 yo seemed to me exceptional for a standard expression, the Chenin Blanc finish sticks in my mind. I regret not having the space to buy a bottle at the time. Nose: Light, citrus-y — plenty of lemon, and some hay. Palate: Very easy to drink with classic bourbon notes of vanilla and a wee bit of spice. Finish: Quite short with very little spice, but satisfying. Nose: Cherry, ginger, and a bit of a fruit bowl. Palate: Overwhelmingly bitter at the back of the palate — I didn’t note anything else. Nose: Toffee, brown sugar, rich stewed fruits. Palate: Incredibly smooth, with lots of chocolate and ginger notes. Finish: Light and delicate, but lingering. Nose: Chocolate and toffee — very rich. Opens up with water to include crème brulée. Palate: At cask strength, lots of dark chocolate, bitter orange and black currants. With a few drops of water, it takes on a lighter character with more lemon and orange. Finish: I didn’t note the finish — but I noted how much I liked this particular expression! Palate: Dark chocolate, oak and bitter orange. Two thumbs up to Glen Moray for providing a true five-senses experience! I’m looking forward to further enjoyment of this distillery’s whisky as it becomes more widely available in the US. Bonus photo: what they do with old casks in Speyside. On the same day we visited Aberlour, Sunjay and I penetrated further into beautiful Speyside and took part in Balvenie’s rather-exclusive distillery tour. Although we were late getting there (ah, the travails of public transport), no one else on our seven or eight person tour seemed to mind — they were all enjoying tea and shortbread in the tasting cottage. How civilized! We made our way to the malting floor, empty and a bit forlorn as the distillery was in the middle of silent season, but still redolent with the smell of malted barley and rather romantic thanks to its quaint fittings. The guide allowed us to peer into the kiln where the malted barley dries so nicely. It looked (and smelled!) so inviting I wanted to lie down in it and take a wee nap. Instead I contented myself with a wee taste — nutty and rich, perfect for porridge! 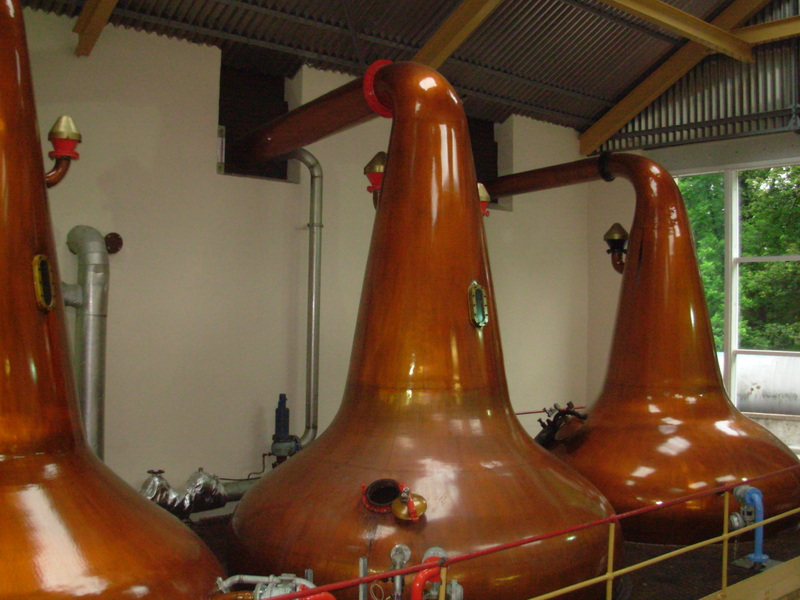 Of all the stills I’ve seen, the Balvenie pot stills are some of the loveliest. Notice the William Grant emblem — a charming logo I’d love to see in future brandings. No visit to Balvenie would be complete without entering their marvelous cooperage. Simply walking through yards full of casks overwhelmed me with the kind of awe usually reserved for astronomical phenomena. Witnessing the coopers hard at work putting casks together, taking them apart, repairing others was a privilege and much more riveting than I initially supposed: I could easily have poured myself a dram and whiled away the afternoon watching in fascination. We ended the visit in the warehouse, which like all whisky warehouses is the sort of place I picture myself being locked in and happily living off fumes and the occasional siphoned spirit for the rest of my days. 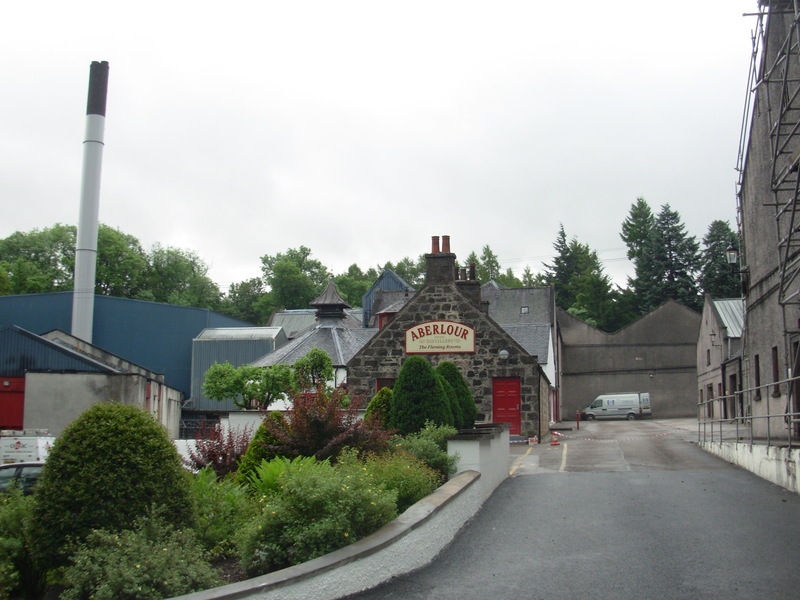 As at Aberlour, Balvenie offered a “bottle your own” experience from three different casks. Nose: Dark fruits, honey, wet grass, and hay. Palate: Incredibly complex with dark chocolate and a mocha flavor that was nearly stout-like. Balanced well with vanilla, spice, and plums, hints of icing sugar. Finish: All I wrote was “goes on forever”. Having had the privilege to taste a couple of 30yo + Balvenie single cask whiskies earlier in the year, I knew the standard 30yo expression would not disappoint. In fact, the only disappointing thing is that at £335 I am going to have to wait a long time to afford a bottle of my own! I really enjoyed my visit to the distillery, which is set far off the road behind a somewhat mysterious stand of forest. Although our guide admitted that she was more of a Glenfiddich devotee, she gamely led the tasting with notes from, I believe, master blender David Stewart. My previous enjoyment of Balvenie allowed me to take this tasting a bit casually, quaffing some and sipping some whilst exchanging banter with others on the tour. As a note to those who want to visit Balvenie, be sure to book your spaces well in advance. The tours are kept deliberately small (a major benefit, in my opinion) and it’s my impression that they fill up quickly during the high season. If you manage to get a spot, I hope you find it as enriching and delightful as I did. – moved from one state to another, unpacked and reorganized my life. *I actually got married in August 2011, so that my fiancé-then-husband, Sunjay, could get a visa to join me in Scotland for the year. It was a strictly-immediate-family affair, with no celebration to speak of, so this year we renewed our vows and held a reception with all our family and friends. On top of that, my mother-in-law organized a Hindu wedding ceremony. Three weddings, no funerals. In light of those events, I hope it’s okay that I took a hiatus. I’ll try to be more with it from here on out, although I’m going back to work full-time tomorrow and frankly have no idea how I will feel for awhile. I’m still sorting out all that reverse culture shock business and trying to figure out how to be a New Yorker again. I miss Scotland terribly, so this post, in addition to being my re-entry to blogging, will function also as a chance for me to wallow in my reminiscences for awhile, whisky in hand, head in clouds. Before life got so crazy (or perhaps this just contributed to the craziness), Sunjay and I went for one last Scottish hurrah through Speyside, Orkney, and Shetland. The next four posts will showcase the whisky highlights of the trip. Our first stop was Aberlour Distillery, which at £12 rated as a bargain even before tasting the whisky. The friendly, knowledgeable guide whose name I have forgotten (Sarah? Julia?) led us through the usual mash tuns and wash backs, stills and spirit safes while detailing the history of the distillery and its founder, James Fleming, who was a businessman and philanthropist whose contributions in both fields still give back today. These days, Aberlour is owned by Pernod Ricard. The tasting, of course, was more or less what we came for, and it did not disappoint, In fact, I think it’s the best distillery tasting I’ve had yet, both in terms of quality of spirit offered and content of the “tutored” session. In this aspect, our guide shone with evident passion and knowledge which made for an ideal atmosphere. Look at the size of those drams! We started with Aberlour’s new spirit (“clearac”) which is unaged, extremely strong, and basically right off the still — this is what goes into the casks. Think of it as proto-whisky. To me, it was quite like other clearacs I’ve tasted in that it had the usual oats-and-honey smells with strong tones of grapes and currants and a thick mouthfeel. Not bad, not whisky. Throughout the tasting, I sipped and sniffed and reserved bits of each dram to compare at the end. Some of my notes, therefore, reflect a healthy amount of breathing — I certainly didn’t get every note on the first time around. Nose of banana, vanilla, and light caramel — reminded me a lot of a Mary Jane. Palate extremely peppery but still light with oak and leather on the finish. Improved with time/air. Nose of dates and raisins, icing sugar, some maple sugar too. Thick and velvety palate, rich with dark fruits and syrup. Long finish with just a hint of bitterness and everlasting sugar. Both this and the preceding Bourbon Cask were available to”bottle your own” in the tasting room that day. Available only France, which is a shame as I found it highly quaffable. Nose of pear with an earthiness that reminded me of a certain Mortlach 15. Despite the sherry finish, heavy bourbon notes prevailed throughout a smooth and creamy palate. Finish short but satisfying. I could see myself drinking this on a nearly daily basis. With a nose of berries — raspberry and bramble mostly — and a lovely cinnamon-and-pepper palate, I loved this whisky even before it ended. Which it nearly didn’t. I swear, they had to kick me out before the finish was done. Truly a remarkable and delicious whisky. Having tasted a whole range of A’bunadh batches from 35 to 39, I already knew what to expect with this one — and that was a good thing. The A’bunadh (“the original”) range came about when some distillery workers in the 70s discovered a bottle of whisky in the wall with a newspaper from the late 1800s wrapped around it. Realizing that they’d stumbled on what may have been the original recipe for Aberlour whisky, the distillery sent the spirit for analysis and has produced this expression as a way to reach back through the annals of time and recreate what had once been lost. Of course, each batch (no age statement) is slightly different from the others, so if you find one you really like, buy up as many bottles as you can because it ain’t coming back. Batch 38 is good (though batch 35 is definitely my preference out of all the ones I’ve tried) — typical sherried notes of plum and other cooked fruits, but with a lovely twist of bitter orange or perhaps orange oils. It improves with a bit of water and really packs a punch (a good one!) on the finish. 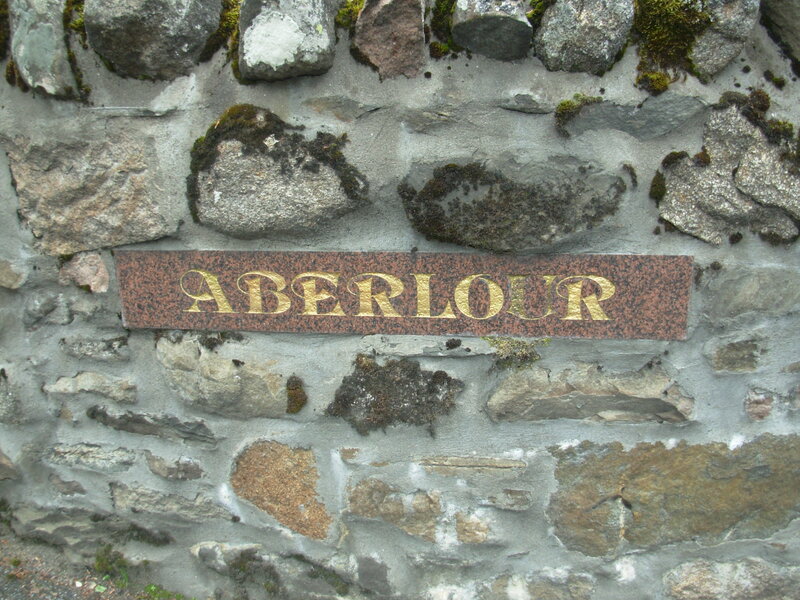 Visiting Aberlour made for a marvelous start to our long trip. Big thanks to our lovely guide and the staff at the distillery who made us feel so welcome and even allowed us to store our rucksacks in the manager’s office. I sincerely hope to visit again someday.